I am writing in regards to the fantastic service I got from CopperRidge Property Management. As spring showed up my lawn and back yard were both looking in really rough shape, I had to put my house on the market ASAP for personal reasons and asked Ken to see if he could get the work done in 2 days time as the property was going to be shown on the third day. Despite the VERY short notice they pulled through and I couldn't believe the difference. Everything looked perfect and in two days they transformed my front and back yards from being neglected by myself to the best looking yard on my street of about 40 houses. The house sold only three days after it was listed. I guarantee a huge part of that was the instant curb appeal that Ken and his team created at my house. I cannot thank you all enough for the effort you put forth to help me get this house sold as fast as it did. Thank you, thank you, thank you. I happened to be using Google maps to look at our house and noticed how well our lawn looks so I thought I'd write you a quick note to thank you. Before changing to your Turf Farmer Lawn Care services we used to use the services of a larger more well-known lawn care company. My neighbour still does and I can't believe the difference in the quality of our lawn compared to theirs. Please see the picture attached. I also like how you keep us informed on the progress of our lawn with your service reports which you leave for us after every visit. I'm very happy I made the switch. 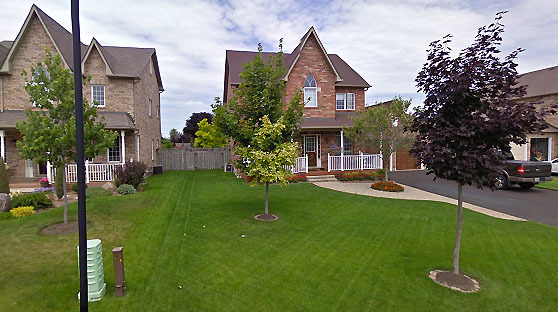 Thanks again, CopperRidge, for making my lawn the best in the neighbourhood!